Guys, it's no secret that I've been slammed lately, especially with the upcoming holiday ebook. My friends have been helping me out by offering to do guest posts for this blog and I'm incredibly lucky to have friends who are, in addition to being generally awesome, talented bakers. Today's guest post is brought to you by my friend Noah. Noah is probably just as passionate about baking as I am, and, realistically, is probably a more talented baker. While I'm intimidated by things like potato breads and pie crusts, he's fearless in the kitchen and readily tackles the things that I frequently avoid. After all — it was Noah who taught me how to stop worrying and love the pie crust. 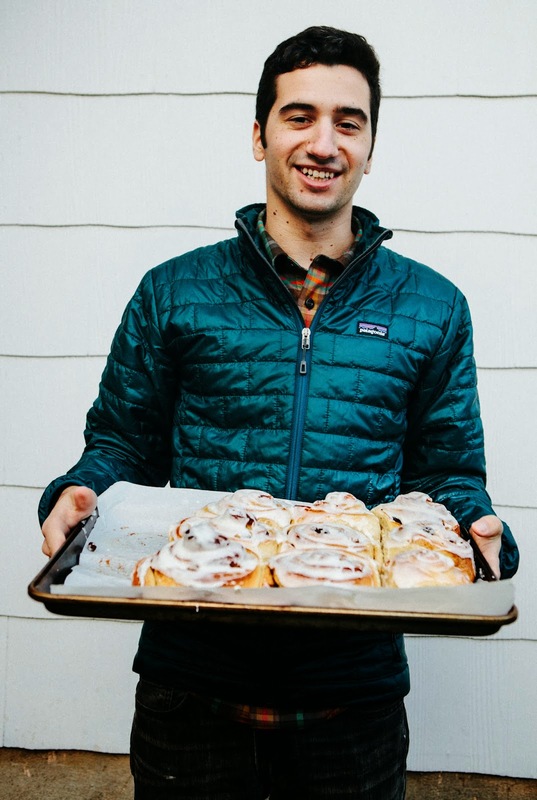 PS — In case you're wondering where the other three cinnamon rolls went, we ate them. Yep. No shame. It’s a funny thing. There’s a food truck in my hometown, located in the parking lot of a sporting goods store, that’s known for their excellent cinnamon rolls. It’s a symbiotic relationship wherein people come for a bun, feel guilty, and leave with new running shoes. And it’s working because both businesses have been going strong for as long as I’ve been a seeing, thinking human being. I don’t have much to say about cinnamon rolls other than a good one is a wonderful thing, while a bad one fills you with regret. 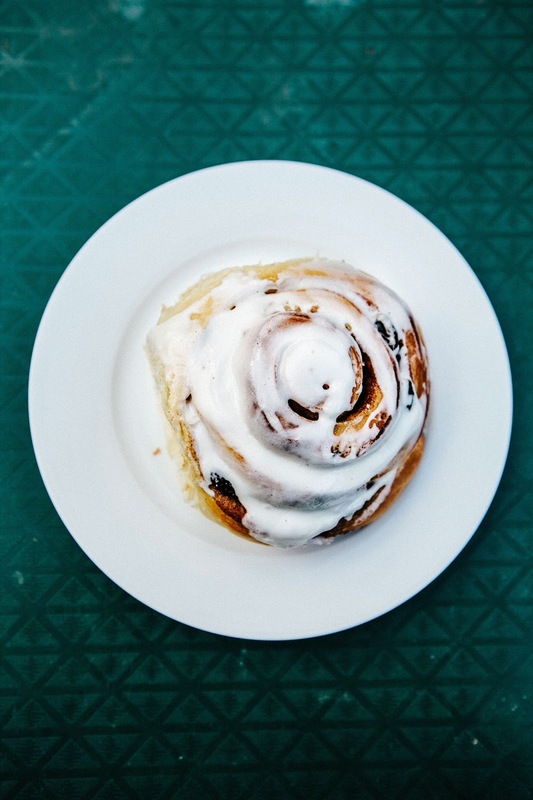 I still shudder when I think about the cinnamon roll that I had in Snowville, Utah. It came with a slab of BUTTER on top of the icing. There’s some pretty country in remote parts of Utah, but you might consider bringing your own food. I like this particular recipe for cinnamon rolls because it has more going on other than just lots of sugar and butter. The acidity of the buttermilk helps produce a light and moist roll that is good on its own. But it’s really the glaze that makes it; the cream cheese buffers the sweetness of the icing and makes the texture silky and enticing. 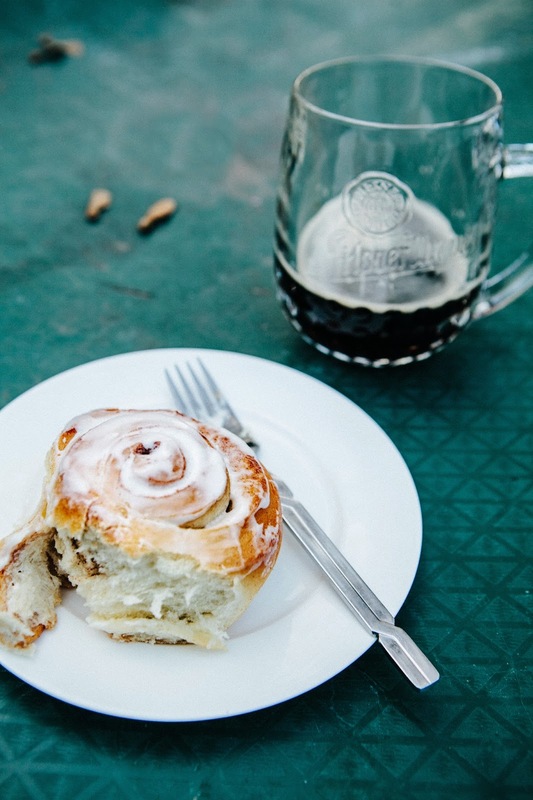 The only real challenge is that if you want to make these for brunch, you’re going to have to set your alarm clock for the hour of the wolf (that is to say, predawn). Here’s the thing, though — waking up before dawn to bake things from scratch can be a major bummer if your attitude isn’t right. Recently I’ve found a way to make it work with my own symbiotic relationship of sorts; that is, watching soccer as I bake. Here on the west coast, games in the English Premier League kick off pretty early in the morning, which for me is the perfect diversion from waiting around for dough to rise. Baking is improved by soccer and soccer is improved by baked goods (although goals also greatly improve soccer, sigh). What I’m saying is waking up at ungodly hours to mix dough is unpleasant, and yes, waiting for dough to rise is like being chained to your kitchen. But if you can find a way to make it part of your schedule it’s undeniably rewarding. If you’re inviting friends over for brunch at 10:30AM, then I suggest mixing the dough at 5:30AM. I give myself plenty of time because I move slowly at 5:30AM and mixing takes longer than it should. I use instant/bread machine/rapid rise yeast because there is no proofing and the rises are more consistent. It’s fine to use active dry yeast but the future is here — might as well embrace it. It’s also fine to substitute powdered buttermilk for liquid buttermilk. Follow the directions on the container, mix the powder in with the dry ingredients and the water with the wet ingredients. Remember to use warm water (around 100 (F) degrees) as the recipe says to do for the liquid buttermilk. In a large bowl, whisk together 7 cups all-purpose flour, 1/3 cup granulated sugar, 3/4 teaspoon baking soda, 2 teaspoon salt and 1 tablespoon yeast. Set aside. In a large liquid measuring cup, whisk together 2 1/3 cups buttermilk (warmed to lukewarm), 2 eggs, and 1/2 cup vegetable oil. Set aside. Transfer the dough to a greased bowl, cover with plastic wrap, and store in a warm place until the dough has doubled in size, about 1 1/2 hours. Use a pastry brush to brush the rolled dough with 1/3 cup melted unsalted butter. Sprinkle heavily with a mixture of 3/4 cup granulated sugar and 3 1/2 teaspoons cinnamon. Scatter 1 cup of raisins onto the dough. Working lengthwise, roll the dough into a log, pinching its edges to seal. Cut the roll into 12 pieces, each about 2 inches wide. Place cut sides down on a parchment-lined 18 x 12 inch jelly roll sheet pan, spaced 3/4 inches apart. Cover with plastic wrap and let rise in a warm place until the edges of the roll are rounded and touching, about 1 to 1 1/2 hours. Once the rolls have risen, preheat the oven to 350 (F). Bake the rolls in the preheated oven for around 25 to 30 minutes, or until the edges of each bun are golden in color. Let cool on a wire rack. While the rolls are cooling, make the cream cheese glaze. Combine 3 ounces softened cream cheese, 2 tablespoon milk, and 1/2 teaspoon vanilla in the bowl of a freestanding electric mixer fitted with a paddle attachment and beat on a low speed until combined. Add 1 1/2 cups confectioner's sugar all at once and beat until fluffy and of drizzling consistency. 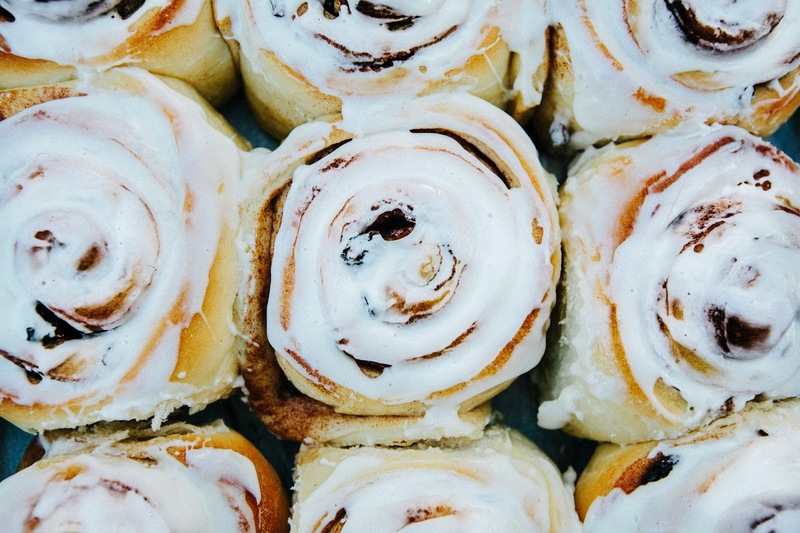 Use immediately to drizzle on top of each cinnamon roll while the rolls are still warm, using a rubber spatula or knife to spread out the glaze. These rolls really look gorgeous! Noah, These look absolutely fabulous. Over the years, I've lost my zest for baking because I just didn't want to consume the calories. Although this morning, I walked an hour to and from a grocery story just to find and try my first cronut. I guiltlessly washed one down with a piping cup of coffee. I want to eat this kind of food, but burning the fat off, or rather, finding the time to burn the fat off, is a challenge. So, I'll look at the pretty pictures instead and buy a cronut once a year. You guys look fab, tho. That looks sooooo good. I also love your tip for rising! Thanks-- I didn't know about the light in the oven trick! 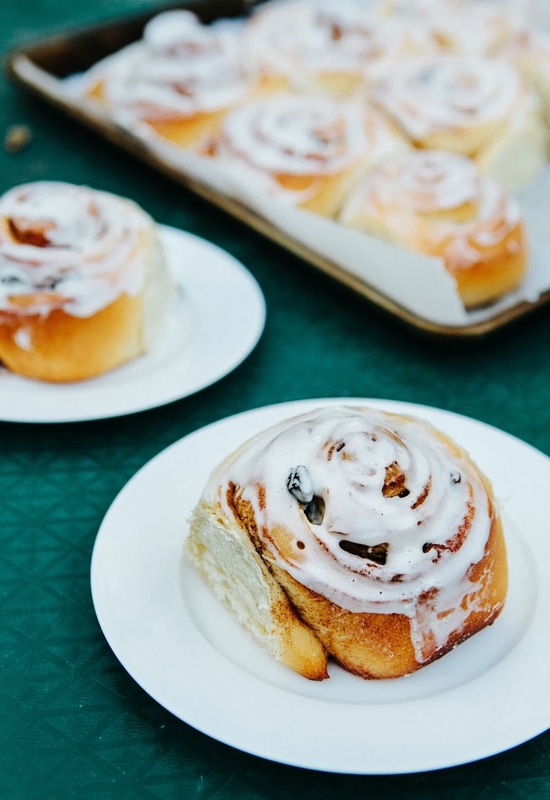 These look like seriously good cinnamon buns! Cream cheese glaze! oh my gosh. I cannot wait to try this recipe! Oh goodness, I just want to eat a entire batch of these! would it be okay to let these rolls rise in the fridge overnight and bake the next morning? Yes, I think so but I've never tried it (there's too many other "projects" in my fridge to make room). For questions like these I consult Rose Levy Beranbaum's The Bread Bible. In her sticky buns recipe, she suggests that following an overnight shaped rise in the fridge to wait up to 2.5 hours before baking. For soft rich doughs it's important that the shaped (second) rise is completed fully before going in the oven. This is in contrast to most other breads that should be slightly underproofed in their final rise. Thank you! I've heard of that book, I might have to borrow it sometime.